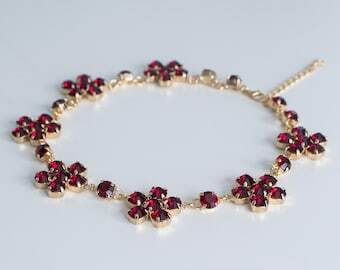 Regency Reproduction Dark Red Pansy Necklace. Siam Ruby Rhinestone Paste Glass. 18th Century, Rococo, Colonial, Georgian, Historical. Regency Reproduction Red Coral Ribbon Tie Necklace. Rococo, Colonial, 18th Century, 19th Century, Georgian, Historical. 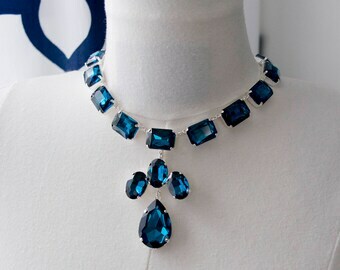 18th Century Reproduction Sapphire Queen Anne Collet Necklace. Blue Rhinestone Paste Glass. Rococo, Colonial, Georgian, Historical. Announcement Looking for jewelry and clothing accessories with a 18th/19th century historical flair? Then you have come to the right place! If you are interested in a custom piece made just for you, feel free to send me a message. Looking for jewelry and clothing accessories with a 18th/19th century historical flair? Then you have come to the right place! If you are interested in a custom piece made just for you, feel free to send me a message. 18th Century Style Jet Black Rhinestone Collet Necklace. Glass Stones. Regency, Rococo, Colonial, Georgian, Historical, Anna Wintour. 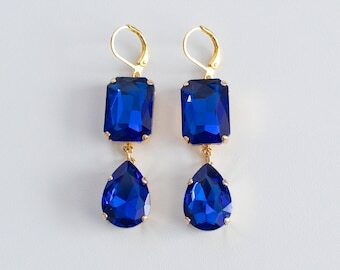 18th Century Reproduction Sapphire and Crystal Earrings. Rhinestones, Paste Glass, Gold. Rococo, Colonial, Regency, Victorian, 19th Century. 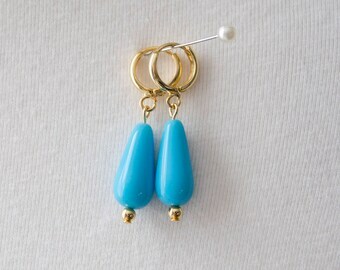 Regency Reproduction Turquoise Glass Drop Hoop Earrings. Blue and Gold. 18th Century, 19th Century, Georgian, Victorian, Historical. 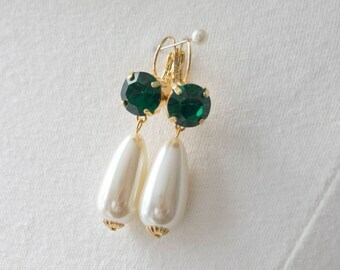 18th Century Reproduction Emerald Rhinestone and Pearl Drop Earrings. Green Paste Glass. Rococo, Colonial, Regency, Victorian, 19th Century. 18th Century Reproduction Peach Rhinestone Collet Necklace. Light Pink Paste Glass. Regency, Rococo, Colonial, Georgian, Historical. 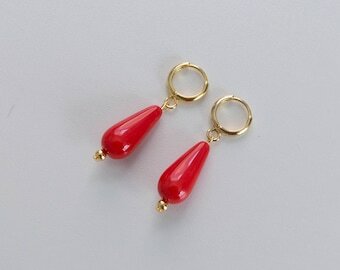 Regency/18th Century Reproduction Coral-Colored Glass Drop Hoop Earrings. Red and Gold. 19th Century, Georgian, Victorian, Historical. 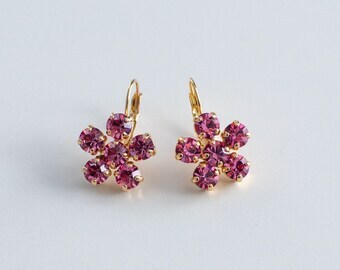 18th Century Reproduction Pink Rhinestone Flower Earrings. Rose, Gold. Rococo, Colonial, Regency, 19th Century, Historical. 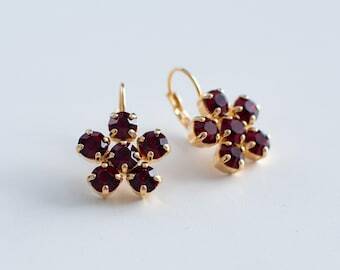 18th Century Reproduction Dark Red Rhinestone Flower Earrings. Siam Red, Ruby, Gold. Rococo, Colonial, Regency, 19th Century, Historical. 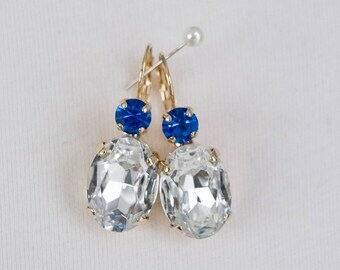 Light Blue Rhinestone Earrings. Sapphire, Gold, Leverbacks. 18th Century, Rococo, Colonial, Georgian, Regency, Historical. 18th Century/Regency Reproduction Light Topaz Collet Necklace. Optional Matching Earrings. 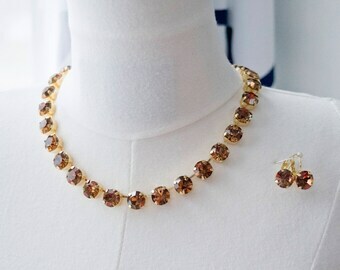 Brown Glass Rhinestones. Colonial, Historical. 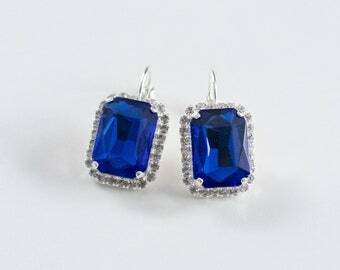 Sapphire and Crystal Rhinestone Earrings. Blue Paste Glass and Silver. 18th Century, Rococo, Colonial, Georgian, Regency, Historical. 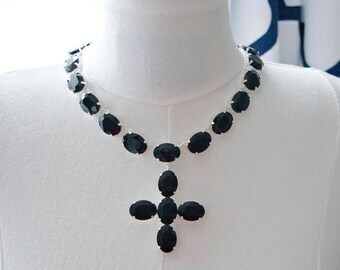 18th Century/Regency Reproduction Jet Black Rhinestone Collet Necklace with Cross. Paste Glass. Rococo, Colonial, Georgian, Historical. 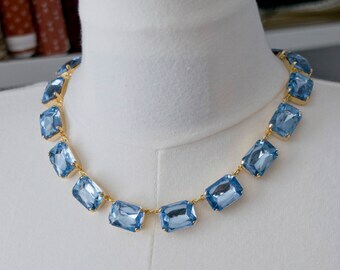 18th Century Reproduction Light Blue Rhinestone Collet Necklace. Paste Glass. Regency, Rococo, Colonial, Georgian, Historical. 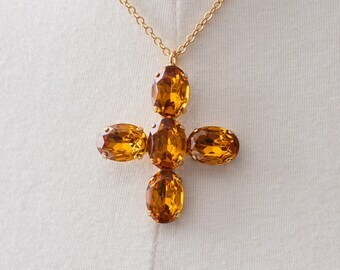 Regency Reproduction Jane Austen Topaz Cross Pendant with Chain. 18th Century, Rococo, Colonial, Georgian, Historical Necklace. 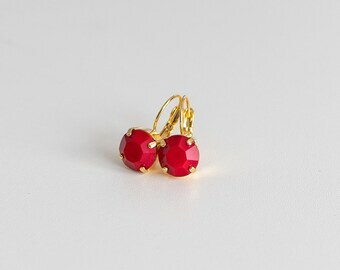 Cherry Red Rhinestone Earrings. Opaque Coral-Colored Glass. 18th Century, Rococo, Colonial, Georgian, Regency, Historical. 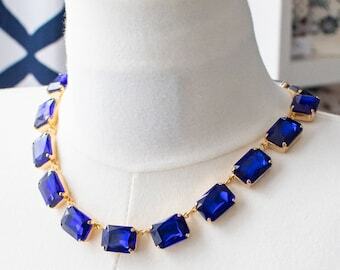 18th Century Reproduction Sapphire Rhinestone Collet Necklace. Blue Paste Glass. Regency, Rococo, Colonial, Georgian, Victorian, Historical. 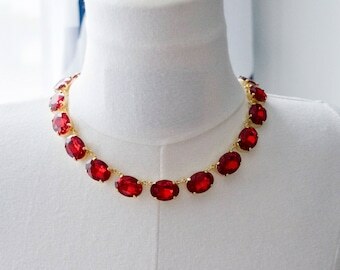 18th Century/Regency Reproduction Ruby Rhinestone Collet Necklace. Siam Red Paste Glass. Rococo, Colonial, Georgian, Historical. This necklace is darling, as described, and was packaged great. 18th Century Reproduction Coral-Colored Glass Necklace. Red with Ribbon Ties. Colonial, 18th Century, 19th Century, Georgian, Historical. Absolutely what I was looking for!!!! 18th Century Reproduction Large Pearl Drop Earrings. White and Gold. Rococo, Colonial, Regency, Baroque, 19th Century, Historical. Regency Reproduction Crystal "Diamond" Collet Necklace. 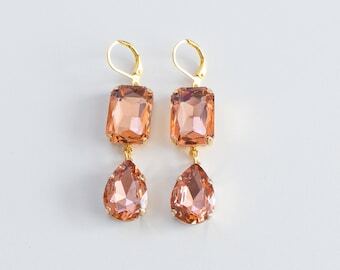 Optional Matching Earrings. 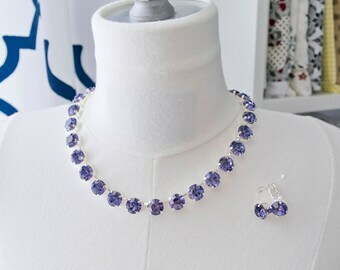 Glass Rhinestones. Colonial, 18th Century, Historical. It’s Black Friday sale time! Through Monday November 26th, all orders of $25 or more get 10% off automatically, no code needed. Plus, you can still use the code WINTER20 for 20% off $50 or more through December 31st, 2018. Regency Reproduction Aquamarine Cross Pendant with Chain. Blue Rhinestones. 18th Century, Rococo, Colonial, Georgian, Historical Necklace. My Etsy shop is back open! And remember, use the code "COCO10" for 10% off through August 31st. 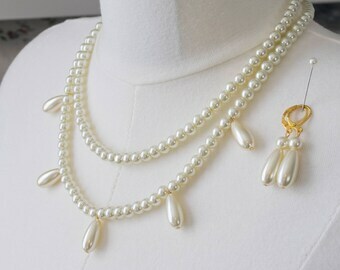 Reserved for Natasha B: Regency Reproduction Two Strand Ivory Pearl Necklace and Earrings. 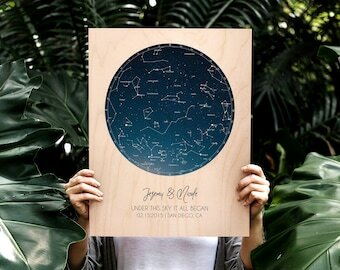 Shop announcement! My store will be closed part of next week while I'm at Costume College. The order cutoff for shipping before I leave is Tuesday July 25th. Otherwise I will be back at the start of August. And remember, use code "COCO10" for 10% off! 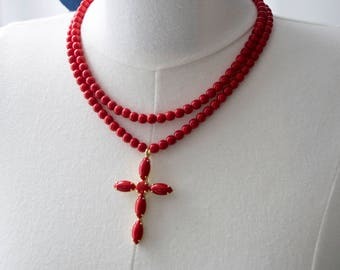 Regency Reproduction Two-Strand Red Coral-Colored Glass Bead Necklace with Cross. 18th Century, 19th Century, Colonial, Georgian, Victorian. Welcome to In the Long Run Designs, specializing in jewelry and other clothing accessories with a historical twist. I am a costumer and crafter, with an emphasis on the clothing of the late 18th and early 19th centuries. Plus I love anything that sparkles. Historical costumer, knitter, beader. I'm happier when I've got a needle and thread in my hands. Thank you for visiting In the Long Run Designs. 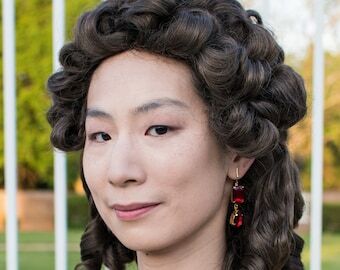 I am a historical costumer based just outside of Washington, DC, specializing in 18th and 19th century clothing. I am also addicted to all types of crafting: jewelry making, sewing, knitting…my house has more craft supplies than food. 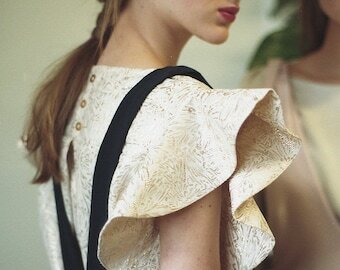 Through my work I try to bring a little Old World elegance to the hustle and bustle of big city life. I want my creations to be equally at home accessorizing reproduction costumes as they are adding some sparkle to your everyday wardrobe. You can follow along with my adventures at http://inthelongrun.wordpress.com/. Due to the unique, handcrafted nature of my items, returns are not accepted. 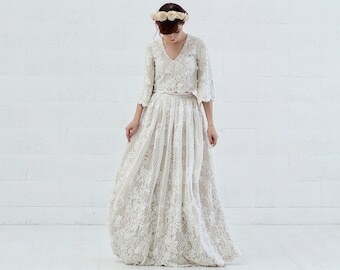 However, if something has gone amiss due to seller error, I will make every effort to resolve the issue. If you are unsatisfied with your order, please contact me immediately. I want you to be happy with your purchase! If the product has been damaged in shipping, please keep all shipping materials and the product and contact me immediately with photos of the damage. Photos will be needed for the filing of an insurance claim. Claims must be initiated within 90 days of mailing. I will file the claim on your behalf, although you will have to fill out an affidavit certifying the damage. I will issue a refund (up to the total insured value, including shipping) after the claim has been cleared. Alternatively, you can request a replacement item (or items), so long as I still have materials to make another. The replacement will be shipped as soon as I have had the time to make a replacement and the insurance claim has cleared. A package cannot be considered lost until 21 days from the date of mailing (longer for international packages, contact me for details). If a package has not arrived by that time, contact me and I will file an insurance claim on your behalf. You will have to fill out an affidavit certifying the loss of the package. Claims must be initiated within 90 days of mailing. I will issue a refund (up to the total insured value, including shipping) after the claim has been cleared. Alternatively, you can request a replacement item (or items), so long as I still have materials to make another. The replacement will be shipped as soon as I have had the time to make a replacement and the insurance claim has cleared. Packages will not be considered lost if the tracking shows that they have been delivered, as then a claim cannot be filed. Please ensure that you have a secure place to accept mail at your address and that your shipping address has be entered correctly. I accept payment in US dollars through Etsy Direct Checkout and Paypal. 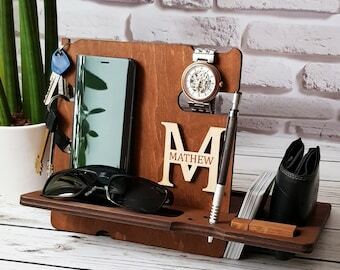 Etsy allows the use of most major credit cards. Payment must be made in full and have cleared before items are shipped. Purchases shipped to Maryland are charged the state sales tax. 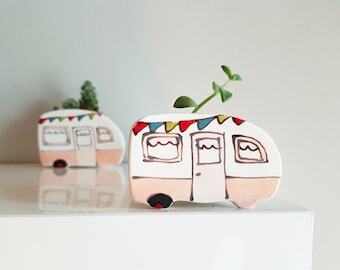 Etsy also collects sales tax for certain other states automatically. I ship using USPS, which includes package tracking to addresses in the United States at no additional cost. By default, I only ship within the United States. If you are interested in international shipping, please message me, and I may be able to accommodate you (note that the buyer will be responsible for any local taxes, such as VAT, and customs fees). Shipping on multiple items can often be combined, as indicated when added to the same shopping cart. I refund any shipping overages over 75 cents. Shipping charges include insurance of up to 100 US dollars of coverage for domestic packages. If you prefer additional insurance, please message me. Packages are typically mailed within 3 business days (unless stated otherwise in the listing). For shipments within the United States, USPS mail usually takes less than a week to arrive after mailing, although times vary based on the final destination. I would love to work with you on a custom order, depending on my booking schedule. Message me so that we can discuss details. Please do not hesitate to contact me if you have any other questions! I may store and process your information through third-party hosting services in the US and other jurisdictions. As a result, I may transfer your personal information to a jurisdiction with different data protection and government surveillance laws than your jurisdiction. My records are kept electronically through Etsy and Google. Please contact me (In the Long Run Designs) if you wish to inquire about changing, restricting, or deleting any of your personal information kept by me. You may have the right to access and receive a copy of the personal information I hold about you. You may also have rights to change, restrict my use of, or delete your personal information. Absent exceptional circumstances (such as when I am required to store data for legal reasons) I will generally delete your personal information upon request. If you have any questions or concerns, you may contact me through Etsy's message system or at inthelongrundesigns [!at] gmail.com. If you are inquiring about the information held by Etsy, I may direct you back to Etsy customer service.